Here’s a simple but effective succulent tray you can make featuring toadstool accessories. -two equal sized pieces of styrofoam or insulation foam at least 12 inches square. One of the two pieces should be at least 2 inches thick. Rectangle shapes work fine as well. -permanent craft glue such as Goop or E6000. 1. Use one of the two pieces of foam as the base for your tray mold. If they are of different thicknesses, use the thicker piece for the top part of the mold. 2. Draw a rectangle or square on the top mold piece leaving a 1 ½ inch thick border around the edges. Use the keyhole saw to cut out the rectangle resulting in a foam frame shape. 3. Position this frame shape on top of the bottom piece of the mold. Use the nails to pin the frame to the base piece, spacing them about 4 inches apart all the way around the frame. 4. Once the mold is assembled, generously spray the inside with the baking spray. 5. 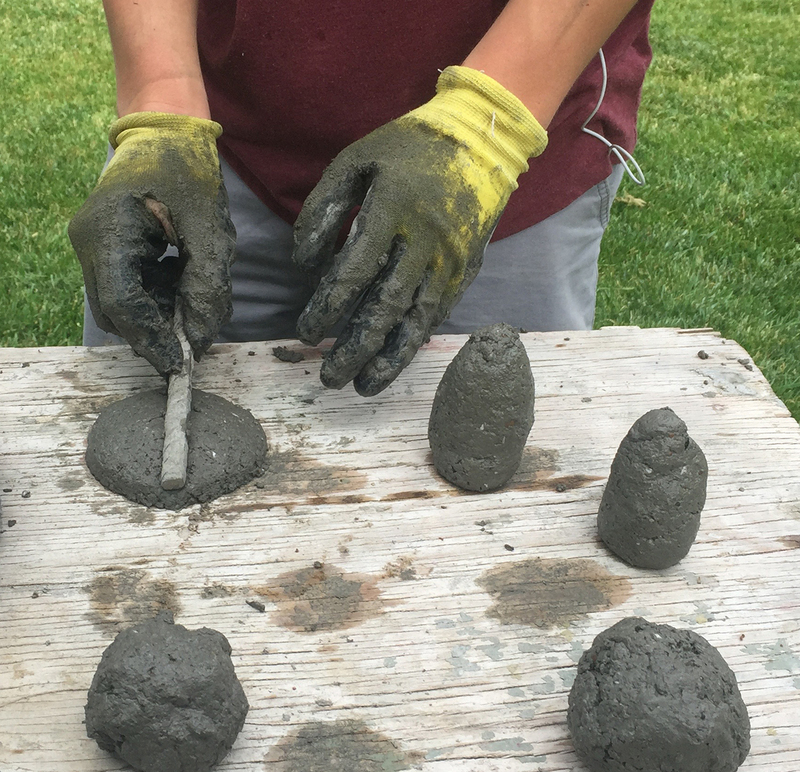 Mix up the hypertufa to a clay-like consistency. It should stick together when squeezed, resembling gray hamburger. 6. 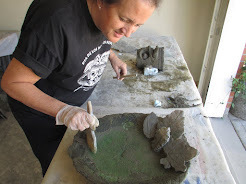 Sprinkle hypertufa over the entire bottom of the mold in a one-inch layer. Press the hypertufa together with your gloved hands creating a smooth solid surface. 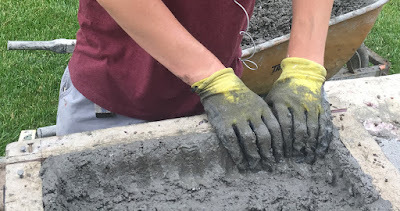 Tamp the bottom layer with the brick to get a smooth even surface. 7. Out line the perimeter of the frame with a thick border of hypertufa. Use your fingers to press it to the sides of the mold and smooth together. 8. Use the brick to square the sides and corners of the tray. You can create a fluted edge by pressing the sides in even increments with the ½-inch piece of rebar. Finally poke one or two drainage holes in the bottom with the pipe or rebar. Set aside, out of the weather, to set and harden for at least two days . 9. Roll 6 baseball-sized balls of hypertufa. This will make three complete toadstools. If you’d like more toadstools, roll two balls for every toadstool. 10. For each toadstool, roll one ball into a thick stalk-like stem. Flatten a second ball into a mushroom cap and round the edges. Be careful not to make the caps too thin or they will break easily. Use the rebar to flute the caps if you’d like. Allow these caps to set over night. The next day they should be hard enough to carefully pick up. 12. Glue the toadstool caps to the stems with Goop Household Cement or E6000 craft cement. 13. Leave the toadstools plain or paint them with exterior paints. 14. Pot up the tray with succulents and add the toadstools for the finishing touch. Whimsical garden decor is Karen Skillett's focus for the 2017 FTSG Spring Sale! 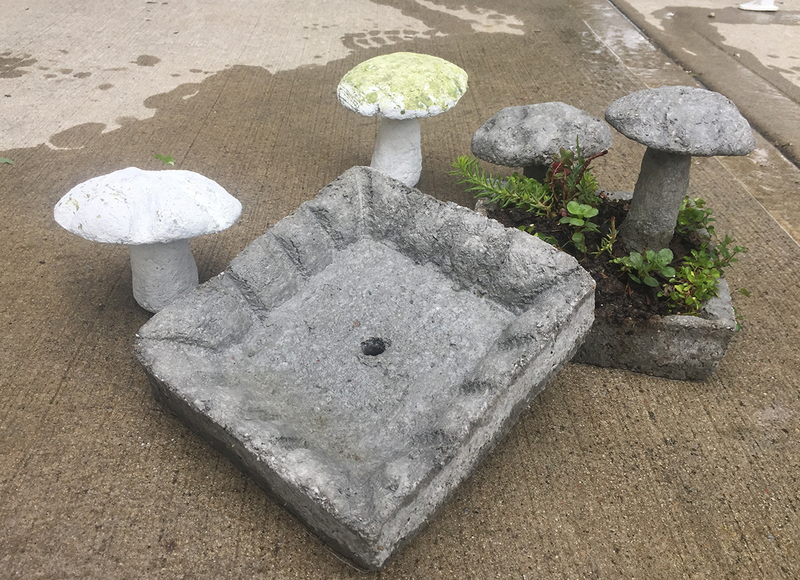 Inspired by her love of fairy gardens and her current obsession with vintage dishes, Karen combines her unique finds to create cheerful accents for your garden! She even searches high and low for hard-to-find vintage demitasse spoons (little spoons) to complete her chimes! And, well, her new bees and ever-present gnomes...she makes those just for fun!! LAMB'S QUARTER- IT'S A WEED! IT'S A PEST! IT'S A SUPER-VEGETABLE! You can garden for years and still learn something new...every year! Earlier this spring, I read an article on a plant called Lamb's Quarter in Organic Living. I got so fired up over this new discovery that I promptly ordered seeds. It is a "wonder plant", similar to Kale in the rich nutrients it provides. The tender top two inches are picked and steamed, sautéed or added to soups and have a flavor similar to its close relative, spinach. Rich in Vitamins A, C, B1 and B2; iron and protein, this nutrient dense green is worth growing in the garden. When the seeds emerged, I was horrified to discover that Lamb's Quarters is none other than a prominent weed in most American gardens! I have pulled and composted it every year I can remember. After i got over this revelation, I decided to give it a chance but definitely will NOT allow it to go to seed. 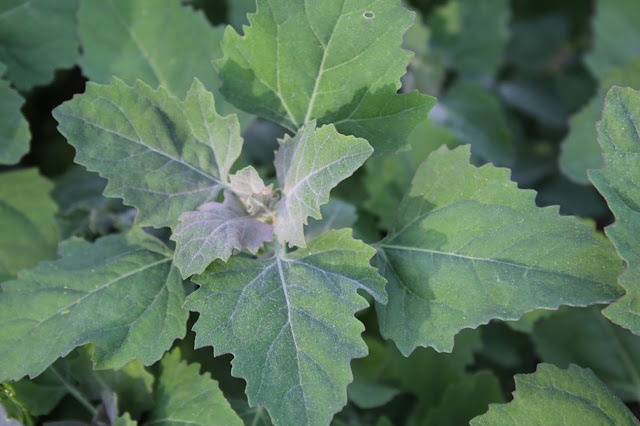 Lambs Quarter requires no cultivation and is relatively disease and insect free. Compare this to many of our cooking greens in the mustard family such as collards and kale which require vigilant bug protection. My mustard family greens are riddled with holes from beetles and the Lamb's Quarter are showing no signs of damage from bugs nor from drought. Rethinking our current cultures agriculture and culinary paradigms, we can adapt our tastes to the relative ease and nutrition of our weeds. My mind has been opened by the garden...once again! You will find a wide variety of interesting handmade artwork at HOME IS THE HEART OF LIFE. We are open every Friday, Saturday, and Sunday including Memorial Day Weekend. If you are looking for some creative fun this coming Saturday, you can make one one of these cool house containers. They are really fun on your front step or back out on your patio. The dirt is tamped into the contianer to form the roof and then you pop in your plants. 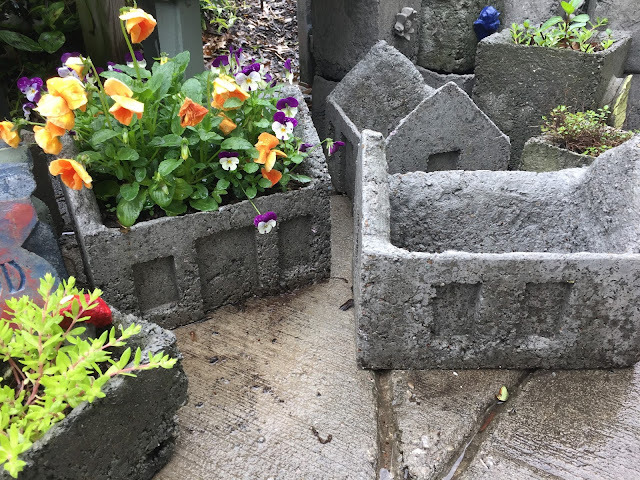 You will make a mold that you can use again and then cast the container with hypertufa and take it home...all in one session! We have a morning session and one in the afternoon. Sign up for our creative workshop for this container at peaceinmygarden.com. While there you'll be able to browse our Spring Sale, Home is the Heart of Life. 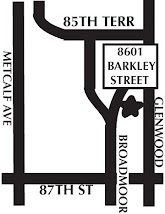 Open Fridays, Saturdays and Sundays from 10:00-5:00 every weekend in May. 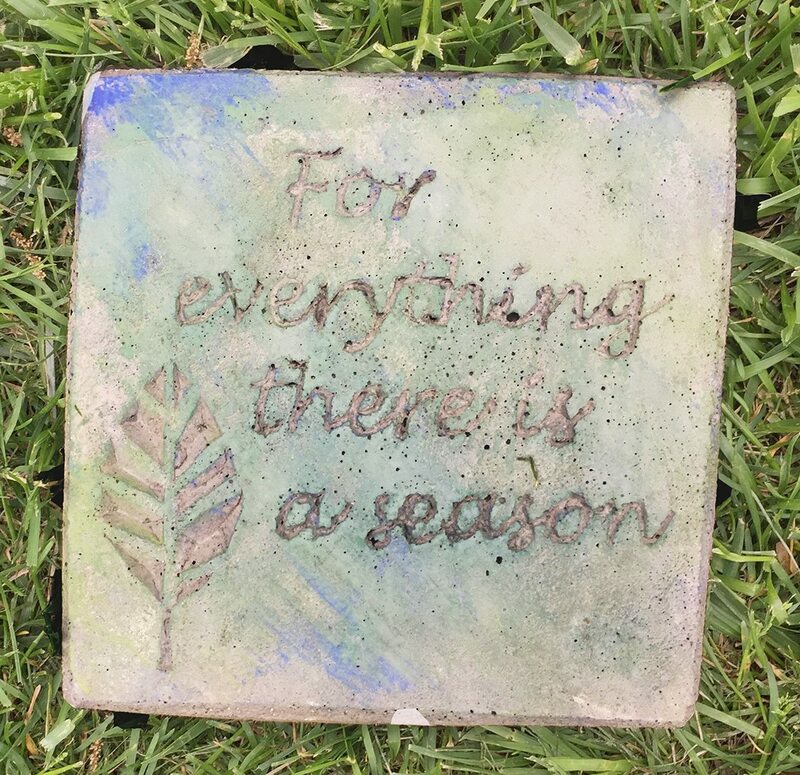 The integration of inspirational messages with images is a key element in the design of our garden artwork. 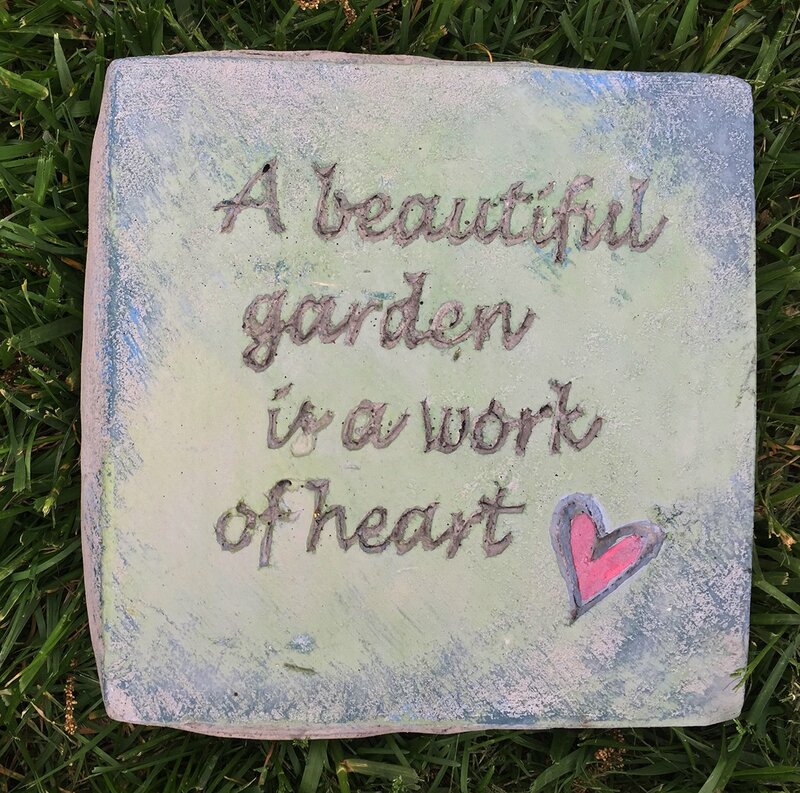 This spring we have four new message stones that reflect our theme, Home is the Heart of Life. Our FB friends voted these four as their top favorites. A message stones can be used in several ways; it can be hung as a plaque, stood up on its edge as a sign in the ground or on a table or placed flat in the ground as a stepping stone. A nice versatile gift for $15! When Karen Skillett decided on a vintage tea party theme for a wedding shower she was hosting, she had no idea it would send her on a quest to "rescue" vintage dishes from thrift shops and antique stores!! A current trend is to declutter and simplify. In the process of doing this, donations of china, silver plate, and crystal are increasing. Karen brings new life to discarded treasures by bringing them to the outdoors! Teacups become precious bird feeders, while spoons and plates become decorative wind chimes! For Karen's spring FTSG workshop, she brings the idea of celebrating High Tea (complete with Scones, biscuits, finger sandwiches and British tea) and combining it with some great crafts that are suitable for ages 10 and up. As you eat and sip tea from vintage china, you will complete two crafts -- a vintage teacup bird feeder, AND a vintage spoon and plate chime. This is a great workshop for friends to enjoy together as a "Girl's Night Out" and makes a great Mother's Day gift! Consider signing up with your mom for a fun multi-generational celebration! Sign up now at peaceinmygarden.com as enrollment will be limited. Two sessions are being offered, Thursday, May 18, and Saturday, May 20. While it rained outside all day, we were busy inside with creative workshops. This bunch had a great time putting together fairy gardens with Natalie Thomas. 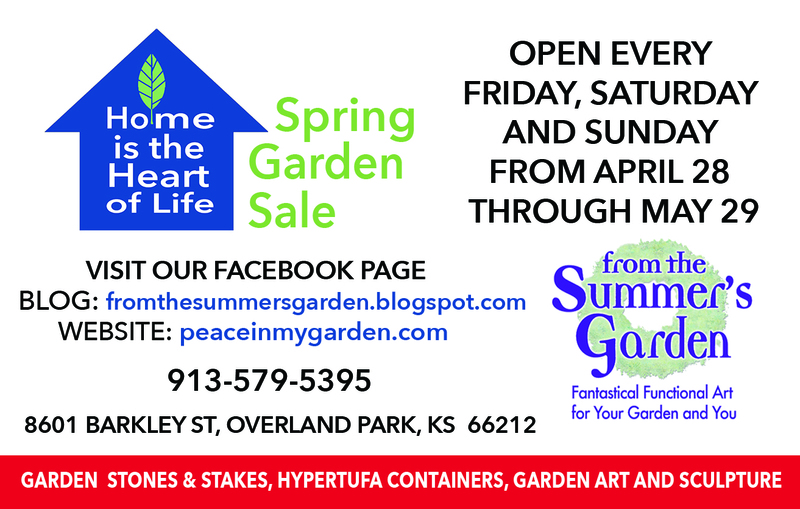 Check out our spring line-up of Creative Workshops for spring at peaceinmygarden.com. Creative fun with friends, family and groups. During May you can also browse our Spring Sale. We're open every Friday, Saturday and Sunday from 10:00 - 5:00. Pottery artist Natalie Thomas has been busy creating a way for all to express whimsy and joy in their garden and home. Birds are a welcome addition into the garden. Natalie has wheel thrown cute little chicks cackling with one another and each with a different name. 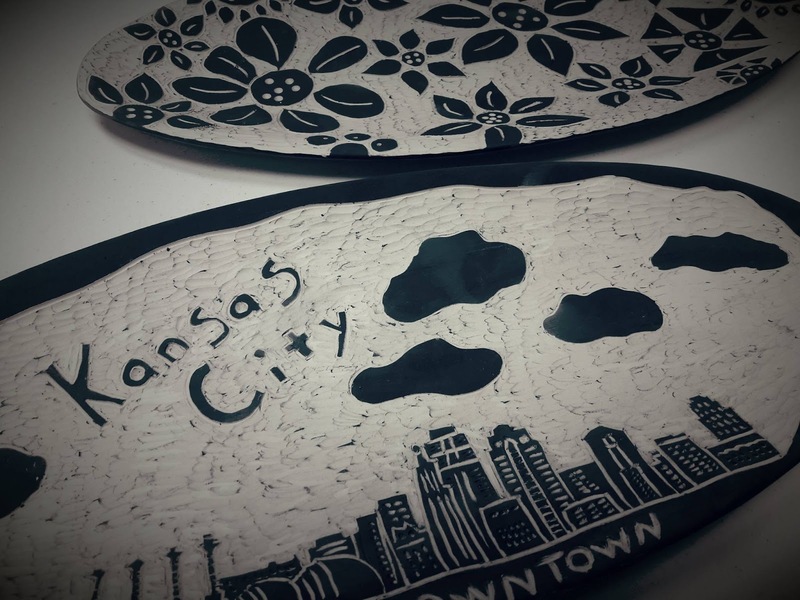 She has mastered a form of decoration known as Sgraffito on her black birds and dishes. 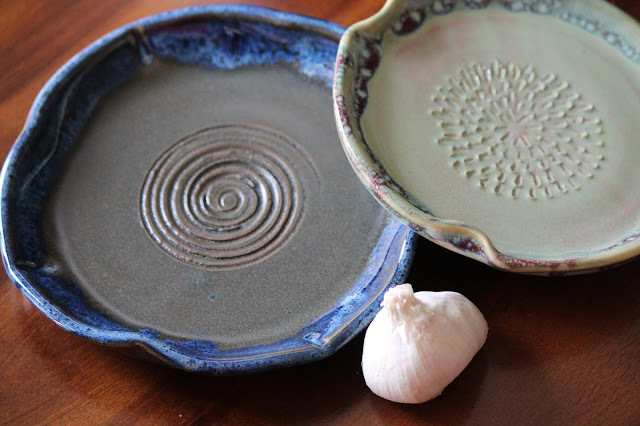 Sgraffito is made by carving through a surface to reveal a lower layer of contrasting color. Inspiration coming from her love of nature and her hometown of Kansas City. Lynn Baxley has been busy preparing for the Spring Sale. Here are just four items you'll want to see for your garden. Not enough birds hanging around your feeder? 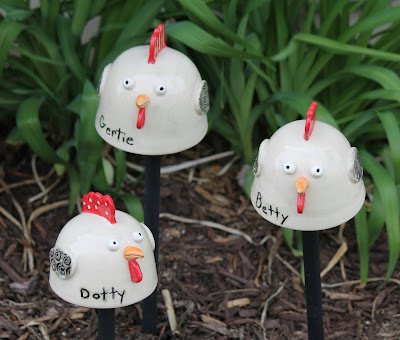 Lynn has solved the problem by adding this whimsical trio to her hanging bird feeders. She bets the wild birds will love the company! The sound of bubbling water is soothing and relaxing. This easy-to-use water bubbler can be placed in your garden or on your patio as a focal point. It comes with just three parts: the base, the pump and the ceramic ornamental fountain top. Succulents are so popular because they are so easy to grow. But one thing they need is good drainage. Among the loops and coils and swirls of her succulent bowls, Lynn has designed in plenty of openings for water to escape. The bowls are glazed in colors to compliment the many shades of succulent colors. 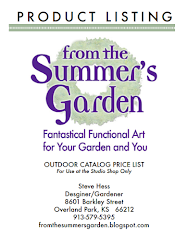 Your plants will look great all summer! I am excited to introduce a new metal artist at our Spring Sale, HOME IS THE HEART OF LIFE. Travis Galloway is a pipefitter by trade and has transitioned the skills of his vocation to create unique metal sculptures that will work nicely in both gardens and homes. Travis uses much of his free time to create fun sculptures primarily made from old tools, hardware, and metal parts. Travis really enjoys taking something most would deem as old or that have lost usefulness, and combining them with other recycled items to create pedestrian scale art pieces that others would be proud to display at their home. Travis can make welded metal sculptures in a variety of sizes and styles, everything from very small to large scale public art scale pieces. Come see his one-of-a-kind pieces currently on display at From the Summer's Garden. I look forward to collaborating with him in the creation of garden trellises, sculptures, tables and birdbath stands. We may even be able to bring back our large garden mobiles! 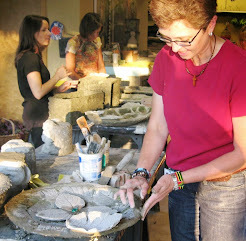 This is a fun memory-keeping creative workshop for spring. The hottest trend in garden walkways is the inclusion of a garden plank with attitude, an oblong stepping stone with a word or phrase. Learn to carve and build a mold using rigid foam. Cast in concrete and take home to finish. You can even reuse the mold! or by calling Steve at 913-579-5395. Lisa’s “bee keeper” hubby experienced a bountiful harvest last fall. FTSG will have plenty of honey available as well as hand-made moisturizing creams and lip balm made from the 2017 bee’s wax harvest.